I made this bracelet by decorating the top of a plain brown peyote band. The color patterns of the peyote band are freeform designed as well, and I used the band to anchor the threads. I made this for a local art show and it sold in the first minutes of the opening. I am a great fan of Freeform Beading. After learning how to do many beading stitches by reading magazines and taking classes at local shops, I didn't want to continue copying other bead artists work. It didn't feel right to me. So I decided that freeform beading might be right for me. I Googled everything I could find on Freeform beading and found that this was the style for me. I practiced with different colors and sizes, peyote and right angle weave, ripped and tossed, ripped and tossed and I eventually began to do combinations I liked. And still, I wanted to do something different. Enter freeform watch bands. I practiced over and over again until I learned how to work the band firmly onto the watchhead. I still have not learned how to adjust the length for different size wrists. Advice anyone? Those are awesome. I love the first one with the freeform embellishment over the peyote strap. The watchbands are a wonderful idea and they look fabulous. these are fantastic! the freeform over the peyote is beautiful. the watch band is gorgeous~love the greens and the nature feel of it! 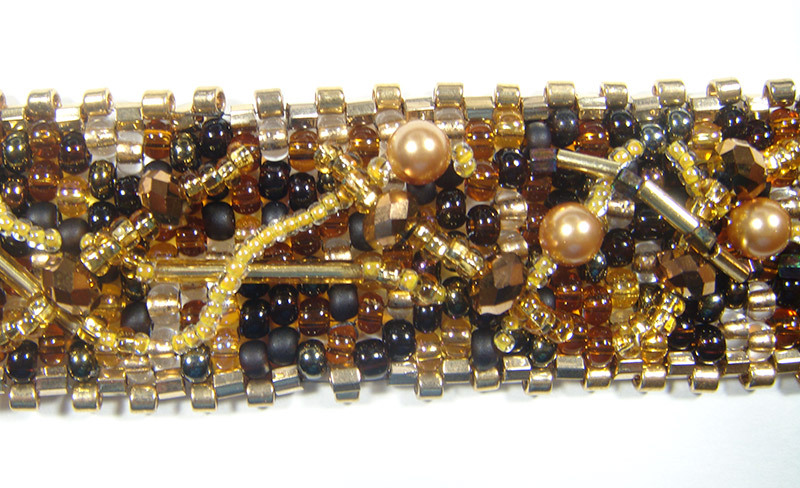 I love the watch band- it's like a time jungle, hehe :) Wonderful job with the earthy colors on your bracelet. Great texture, too. I'm not surprised it was snatched up so quickly! I love the colors you chose for these...very earthy and organic. Beautiful work and I love the idea of making watch bands. Perfect way to make a lovely, personal statement and be punctual!! The watchband is GREAT! Maybe for the adjustable length you could use a length of chain on one end and a lobster clasp on the other? I'd love to see how you solve the question! I love the idea of free form over the band. Lovely color choices, very nature inspired. The watch is a wonderful statement piece. Both are beautiful. I am enjoying this blog hop so much because every single piece that I have seen so far is so unique, so different despite the fact that we all used one technique, freeform peyote. 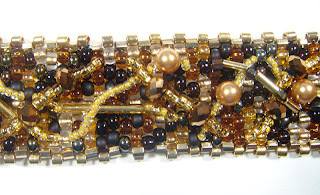 What a great idea Bette to embellish regular peyote bracelet with freeform! 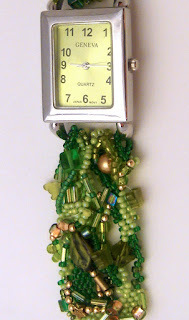 Great idea doing freeform over the peyote cuff and the green watchband is just luscious! Lovely pieces. Great idea to embellish flat stitch peyote. Looks fab. Also like the idea of incorporating a watch. Thanks for sharing these. 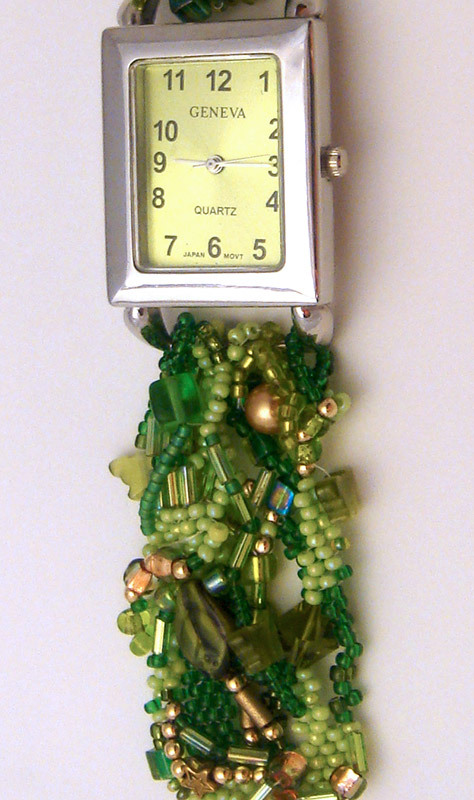 Green is just such an amazing color, so I particularly like that watchband with its variety of beads. But I think you first bracelet has a unique juxtaposition with the clean lines of the base and the freeform embellishment on top. Very cool! Those are both great ideas, and I love the freeform watch band! Great idea! They are both fantastic. I love the green mix of colors in the watchband. Both are very nice, the watchband is a great idea! What a great and different idea! Could you not adjust the length of the original peyote band and make it shorter/longer that way?